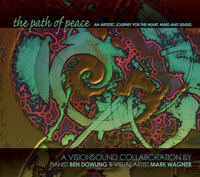 Almost a decade ago, my friend, Ben Dowling, created an extraordinary "visual-music" series entitled, "The Path of Peace." The series featured slowly unfolding images from original artworks coupled with Ben's surround-recorded acoustic piano music. The music went on to be recognized as among the best solo piano recordings anywhere. The "multi-media" nature of The Path of Peace suggested that it was possible to incorporate spoken word as a part of this powerful creative process, and thus the "Audio Drops" project came to be, coupling spoken prayer/meditation/contemplation/teaching and music to create an environment for transformation to take place. We are very proud of the result of this idea, with the release of our initial 21 Days of Audio Drops offered by subscribing to the newsletter. We look forward to hearing from you, as we determine if this idea is something we should pursue. Please let us know, by sharing the idea among your friends and loved ones. Then touch base via social media or email. If you like this Audio Drop, you can subscribe to receive all 21-Days of them by clicking here. Isn't it strange that we seem to be thrown to believe that we have to "figure it all out?" Particularly when this certainty stands directly in our path to self-realization?